This information will be of particular interest to employers, asbestos contractors and others with duties under asbestos regulations, together with those workers currently at greatest risk from exposure to asbestos. The importation, supply and use of all forms of asbestos are banned. However, many buildings, and some plant and equipment, still contain asbestos-containing materials (ACMs). People responsible for maintenance of non-domestic premises, have a 'duty to manage' the asbestos in them, and should provide you with information on where any asbestos is in the building and what condition it is in. If no information is available or it is limited and you suspect asbestos may be present you should have the area surveyed and representative samples of the material you are going to work on analysed. Alternatively, you can assume that any material you need to disturb does contain asbestos and take the appropriate precautions for the highest risk situation. Decide if its possible to carry out the building or maintenance work avoiding the risk of asbestos exposure all together. If that's not possible, identify who might be at risk and the level of possible asbestos exposure from any work. On this basis, decide what work methods are necessary to provide effective control of the risks. Further information on carrying out a risk assessment is available. 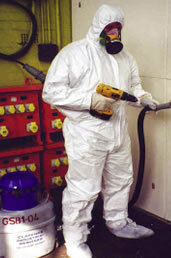 Most asbestos removal work will require a contractor holding a licence from HSE. All work with sprayed asbestos coatings and asbestos lagging and most work with asbestos insulation and asbestos insulating board (AIB) requires a licence. Find a licensed contractor, or find out how to apply for a licence. If it doesn't need a licence, you can do maintenance work on or around ACMs with the appropriate controls in place. Some non-licensed work also has additional requirements, ie notification of work, medical surveillance and record keeping. This work is known as notifiable non-licensed work (NNLW). Any worker who is liable to disturb asbestos during their day-to-day work needs to receive appropriate training to enable them to protect themselves and others.